I parked the motorcycle on the road and started looking for the mark when the owner of the property, Mr. Wayne Croft, approached me. He lives on the adjacent lot. Mr. Croft was very nice and showed me where the benchmark was. I think I would have found it on my own, thanks to the good notes and pictures left almost a year ago by Rich and Zhanna. The mark was approximately 100 feet from where my gps would have taken me. We had achieved our main goal for the day—a successful recovery of nearby triangulation station PINE—and we stopped for a few simple benchmarks on our way back to the Interstate. This mark was a relatively easy find, though we stood on top of it for a minute before we noticed it was at our feet. While we photographed the mark and checked the reference objects, a man who'd been using a Bobcat nearby to clear brush approached Rich to ask what we were doing on his land. He was friendly and gave us no trouble, and seemed at least mildly interested in our explanation of benchmarks. He was surprised that he had never noticed the mark, having owned the land for years. Eventually the man went about his business and we finished up our measurements. We measured a slightly different distance from the centerline of Beaver Dam Road (noted in the official recovery) and took a measurement from the nearest pole (BT Co. 19/A-7/A-8) because the one mentioned in the 1959 description no longer exists (the landowner confirmed that the poles were replaced several years ago). We did not locate the trees that were originally used as reference objects. 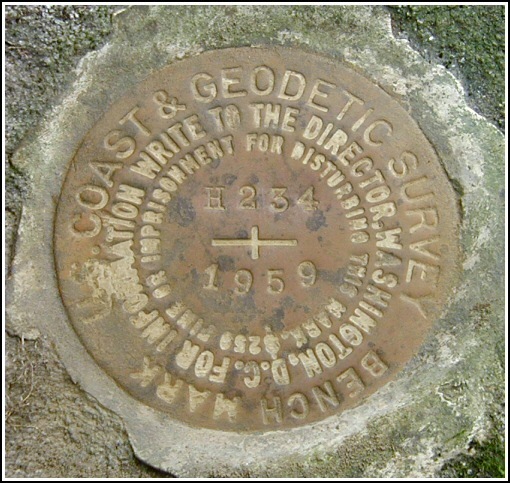 The disk is in good condition with legible stamping, and was found set in the boulder as described in the 1959 recovery note. 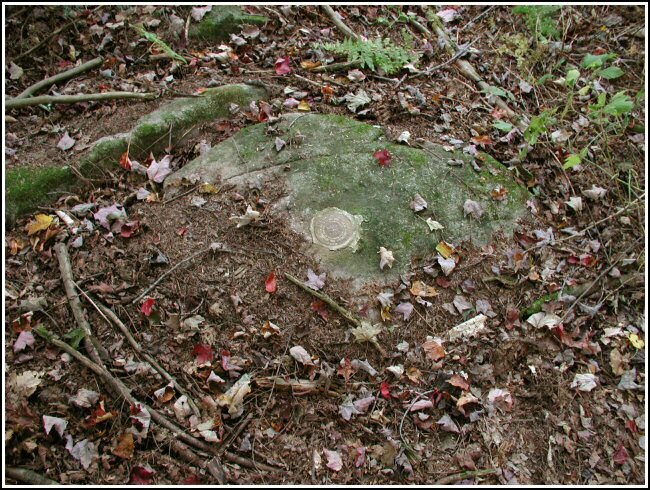 Those who seek this mark in the future should be aware that the mark is located on private—though non-posted—property owned by Mr. Wayne Croft, who lives in the house on the adjacent lot. Station mark recovered in good condition. The mark is located near the T-intersection of Beaver Dam Road (T 389) and Bartleson Road (T 355). 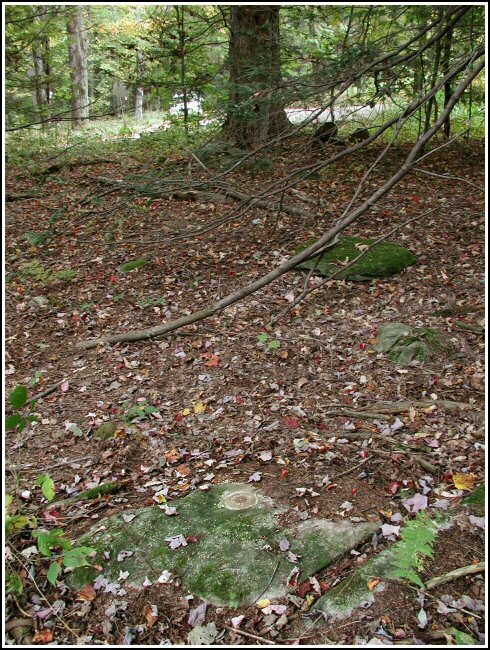 It is set in a boulder as described, approximately 72.3 feet (22 meters) west-southwest of the centerline of Beaver Dam Road and 71 feet (21.7 meters) west-northwest of telephone pole BT Co 19/A-7/A-8. Autonomous (non-corrected) handheld GPS coordinates for the station are 41 20 30.30(N) 075 17 53.46(W). 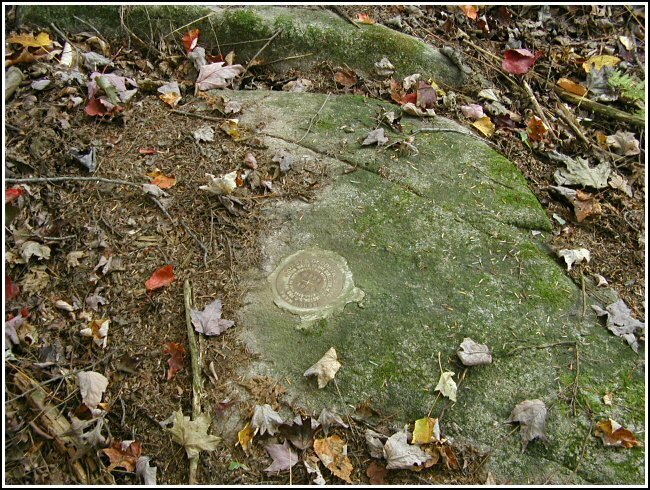 Eyelevel view of the mark on the boulder. 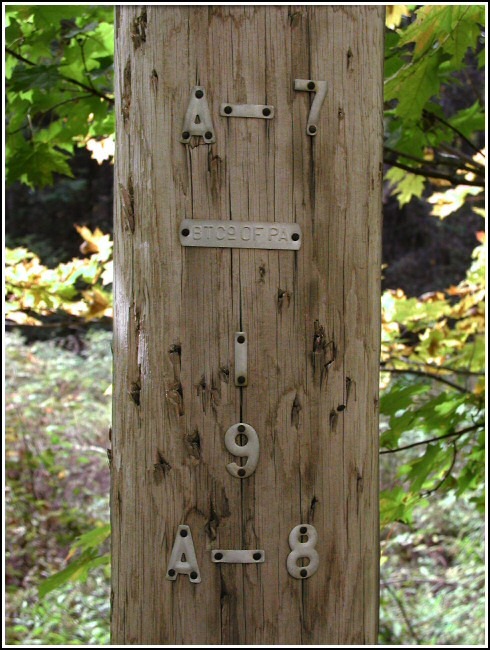 This second order vertical control station was found as described. The historical directions are still usable, except that the road is T-389 (not T-350) and named Beaver Dam Road, which intersects with Bartleson Road (T-355). The station is roughly 72.3 feet (22 meters) west-southwest of the centerline of the road, and 71 feet (21.7 meters) west-northwest of powerpole BTCo. #19/A-7/A-8. 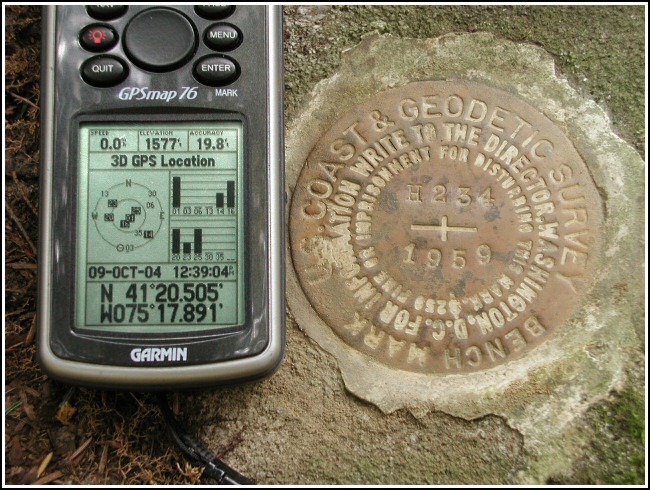 At the station a Garmin GPSmap76 receiver with remote active antenna was used to record autonomous (non-corrected) coordinates which were roughly 47.5 feet from the scaled coordinates listed in the NGS datasheet. The mark is well exposed, in good condition, and the stamped designation is legible. LY1180, “H 234 1959,” Pike County, PA.
Orientation view, facing east and T-intersection. 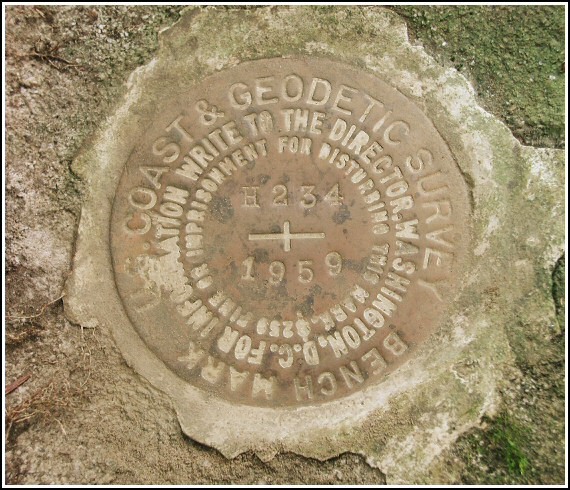 DESCRIBED BY COAST AND GEODETIC SURVEY 1959 2.5 MI NE FROM GREENTOWN. 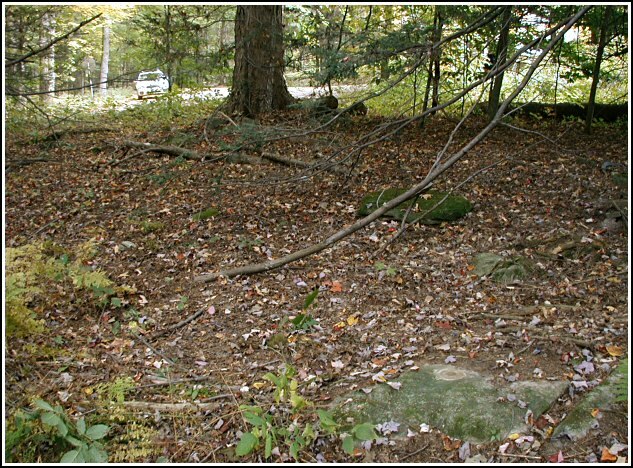 1.20 MILE EAST ALONG COUNTY ROAD 51027 FROM THE POST OFFICE IN GREENTOWN THENCE 0.05 MILE TO T INTERSECTION THENCE 1.25 MILE NORTH ON T 350, SET IN TOP CENTER OF A 5 FOOT BY 3 FOOT BOULDER PROJECTING 3 INCHES, 134 FEET WEST-SOUTH WEST OF A 27 INCH RED MAPLE TREE, 47 FEET NORTH-NORTH EAST OF A 22 INCH RED MAPLE TREE, 33 FEET WEST OF A 24 INCH RED MAPLE TREE, 81 FEET WEST-NORTH WEST OF TELEPHONE POLE NO. A-28, 67 FEET WEST-SOUTH WEST OF THE CENTERLINE OF THE ROAD, 98 FEET WEST OF CENTERLINE OF T INTERSECTION, ABOUT 6 INCHES ABOVE THE GROUND.